During a visit to Rishi Valley School (Chittoor, Andhra Pradesh) the teachers there asked me if I was interested in addressing the junior school assembly. When I happily agreed, they warned me that these students were the most difficult bunch in the school and would not stop asking questions! I then asked the teachers what I could talk about that would be of interest to them. They suggested that I talk about life in the villages of Mizoram (as I had spent time there) and illustrate my talk with images, as this would be interesting to them. 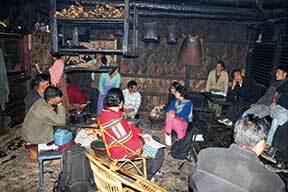 I pondered a bit and thought of talking about my experiences in Nagaland, where I had stayed for a few months and enjoyed many a happy moment. Also I had good photographs of the place to support my talk. As I began preparing for the talk, sorting images, and jotting points I realized that the structure of my talk was turning out to be very similar to the kind of talks I was forced to listen to when in school – showing images from a village and pointing to a home, a school and so on. I remember I had never enjoyed these talks. Not wanting to repeat such a session I pondered for a while on how to carry out my task. As I walked in the beautiful campus, I recalled reading how a good presentation had to be a story – with a beginning, middle or core, and an end. I then thought, “Why not tell the kids a story about my Nagaland stay?” As Josh Stearns stated, stories ‘are roomy and accommodating, whereas facts are confined and exclusionary’. I decided to create a story of the things that I came across in the village as I looked for the meeting place. Yes, I had gone to the village to attend a meeting. The story could start with my beginning the search for the meeting-location during which I would come across landmarks (core) and culminate with my reaching the destination. 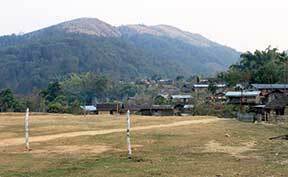 I started from the football field, which also had a volleyball court, situated at one end of the village. This is where I told the other villagers that I would be able to reach the meeting venue, as I had been there earlier and so could find the place easily. I then came across children playing in an amphitheatre – a place where villagers get together for events. Nearby was a community place that had painted walls. The people in the village had created lovely designs on the walls. 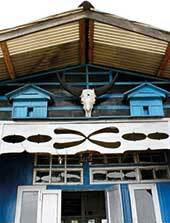 Across Nagaland, each tribe creates beautiful and distinct designs on the walls of their homes or community centres. These designs are specific to each tribe. The houses that the tribes build too are so different from each other’s. A couple of pine trees lay cut in the corner. Pine is a common tree in these parts. As I walked further I saw that people had stacked firewood to take home – a primary medium used for cooking in the village. Reaching another part of the village, I saw a house with a roof made of oil tins. The metal cans that oil came in were flattened and used for the sloppy roofs. Another house, not far off, had beautiful carvings and colour. But most houses in the village had walls made of bamboo. Perhaps because different species of bamboo grew in and around the villages. I turned a corner and saw a familiar looking garage. I found the garage quite beautiful as it allowed sunlight to come in through the gaps. I reached my destination, the venue of the meeting, and saw a wooden box, which I recalled from last time, that people use to store grains as well as to sit on. Tea was getting ready in the centre of the hall – the hearth in these parts sits in the centre of the room. At one point, as I planned and prepared, I had wondered if I was somehow misleading the students and whether I should go ahead. I am glad I did. Today, when I look back I recall the session with happiness. I also realize I had put in images from six different villages lived in by two separate tribes Ao and Sema from the districts of Mokokchung and Zunheboto! After the story, the children asked many questions, which told me that the story had worked and worked well! Here is a small list of the questions they asked. How far is it from Kohima (Nagaland’s capital)? What language do the people in Nagaland speak? Were you able to converse with the people there? Did you go to the forest near the village? What is stored in the box? What is the principal food of the people there? How many times have you gone to this village? Why did you go to this village? Why are there no trees on top of the hill? Does the skull also have medicinal property? Is mithun skull hung outsides homes of strong people? Do all families own mithun? Have you seen animals in the forest? What is the state animal and bird of Nagaland? The author loves long walks (especially in untamed lands) and penning his thoughts; he blogs at http://nimesh-ved.blogspot.in/ and can be reached at nimesh.ved@gmail.com.